Northern Rivers towns, NSW, Australia. Tweed Coast, Byron Bay Hinterland and Upper Clarence region. 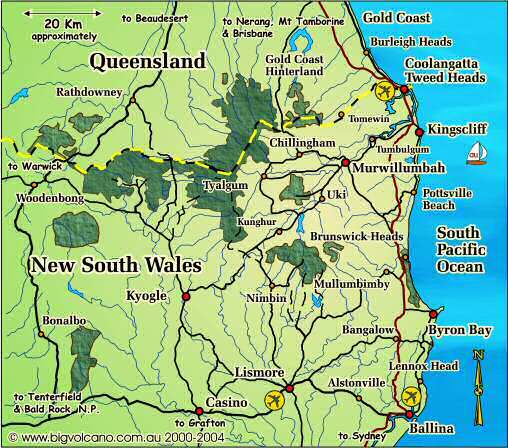 Destinations and tourist information about regional towns of the New South Wales Far North Coast and Gold Coast hinterland QLD. Click on the regional locality map icon to go to an image map where you can select a locality, or alternatively browse our brief town descriptions below and select "More info" to go to more detailed visitor information about the town, with links to local lodgings, tours, cruises, attractions and transport options. It's no surprise that this region, with more than 250 days of sunshine each year on average, and its year round mild and subtropical climate, is one of Australia's favourite holiday destinations. Although we have to say that it also gets it's fair share of rain ... well ... it is rainforest country! Whether it's the beach or the bush, you'll find that our towns and villages are a great place to relax and unwind with loved ones, or to get out and about, reconnect and enjoy the natural attractions of the region. And, if you want a more active or adventurous holiday, there are plenty ways to get an adrenalin kick! Shopaholics will love the range of retail therapy. From the glitz and glamour of the Gold Coast to the unique stylings of the region's artisans and craftspeople, you're sure to find that special memento of your visit here, from the wide range of retail shops. Or sample the local flavour and check out a nearby weekend market. Alstonville Alstonville is located on the Bruxner Highway about half way between Lismore and Ballina, many visitors to the region make a day trip to the Alstonville Plateau to take in the stunning views, and to visit popular local attractions. Motor Inns, B&Bs and farmstays are the primary accommodations available on the plateau, and in the smaller settlements like Tintenbar and Teven, which also boasts an excellent golf course. >> More info. Ballina Located at the mouth of the Richmond River, Ballina relies on fishing, ship building, agriculture and tourism for its prosperity, with resort shopping infrastructure expanding to accommodate the increasing numbers of families visiting and moving to the area. A wide variety of accomodation including apartments, resorts, caravan parks, motels, motor inns, B&Bs, and extensive walking and bicycling paths around the town, make it a great family holiday destination. >> More info. Bangalow Considered part of the Byron Bay hinterland, and less than 15 minutes drive to Byron Bay, Bangalow is located on the old Pacific Highway, and retains some of the region's best street architecture. Federation homes and cottages have been turned into elegant guesthouses and B&Bs, while numerous cabin and cottage accommodations are scattered throughout rolling hills in surrounding villages and small hamlets. >> More info. Brunswick Heads Brunswick Heads is a quiet and peaceful town at the mouth of the Brunswick River, about 1800 people live here, with another 2000 or so people who live at Ocean Shores, New Brighton and Billinudgel, calling the area home. Visitors are attracted by the fishing village flavour of the place, the riverside caravan parks and the truly superb beaches. Accommodation is primarily caravan parks and motels, with newer holiday apartment units now augmenting modest holiday flats. Along with a thriving B&B presence in the hinterland, holiday houses are available at New Brighton and Ocean Shores, just to the north of town. >> More info. Byron Bay The pinup poster child of the region, rapid growth in tourism infrastructure has made it possible for Byron Bay accommodation and tour operators to provide "surf to rainforest" experiences to suit all budgets. There are numerous types of lodgings to choose from including luxury resorts, luxury homes, family resorts, B&Bs, motels, hotels, backpacker hostels, guesthouses, holiday homes, and over a dozen caravan and camping parks. >> More info. Casino Strategically located at the junction of the Bruxner Highway and Summerland Way and sitting astride the upper reaches of the Richmond River, Casino is the rail and freight hub for the far north coast of New South Wales, and best known as a beef production and agricultural centre, with two major agricultural shows mid year. It's also a primary stopover on the Summerland Way, the alternative inland route between Brisbane and Coffs Harbour. This is the country beyond the coast, and some say, "the Real Australia". Accommodation is limited mainly to hotels, motels and caravan parks, with a growing base of farmstays offering a wilderness retreat experience, in the rural settlements and larger land holdings. >> More info. Kingscliff Just south of Tweed Heads, Kingscliff (not to be confused with Kingscliffe in Queensland), with a population of just over 6000, is a beach community offering a wide variety of holiday accomodation and water based activities. Together with the villages of Chinderah and Fingal Head, it is a popular family destination which provides beach and estuary access for swimming, surfing (of course! ), fishing and water sports. >> More info. For visitors who take a road less travelled, a stopover here provides the opportunity to experience a "typical" country town. There a number of caravan parks, a couple of hotels (pubs) and a motel providing accommodation. Out of town, cabins are nestled in the hills, with B&Bs, farmstay holiday cottages and camping available at picturesque locales like Barkersvale, Wadeville, Cougal, Dairy Flat, Lillian Rock and Gradys Creek. >> More info. Lennox Head Located between Ballina and Byron Bay, Lennox Head is a beach resort town with about 1800 permanent residents, situated at the southern end of Seven Mile Beach. Visitors are attracted here by the great weather, incredible scenery and splendid beaches, renowned for their surfing and fishing. Accommodation includes motels, holiday flats, caravan park, backpacker hostel, serviced apartments and resort style complexes. Local real estate agents provide holiday rental services. >> More info. Lismore With a population of just over 25,000 Lismore is regarded as the principal city of the region. All the usual amenities of civilisation can be found here including Lismore airport serviced by Regional Express Airlines, interstate coach services, government services, hospitals and social amenities. A wide range of accommodation and conference facilities are available, and a number of Byron Bay tour operators will pick up in Lismore for day tours to the rainforests. B&Bs and farmstays are scattered through out the picturesque villages and hamlets including Dunoon, Clunes, Bexhill and Eltham, which are the centres for local macadamia and coffee plantations. >> More info. Mullumbimby Know as "Mullum" to locals, Mullumbimby is just up the track from Byron Bay, and is the seat of the Byron Shire Council. This is a traditional Australian rural community that has long survived and prospered on dairying, beef, wool and small cropping. Macadamia Plantations, bush tucker agriculture, farm forestry and nature based tourism are thriving enterprises, while new capital investment is revitalizing the retail precinct, with eateries and new age retail outlets adding a touch of colour to the laid back atmosphere. Available accommodation includes cottages, guesthouses, hotels and motels in town, while an extensive choice of B&Bs and guesthouses can be found throughout the small settlements scattered along the country roads which wind between Mullum and Byron. >> More info. Murwillumbah Very much a traditional style agricultural centre, Murwillumbah is located nearly exactly in the middle of the Mt Warning caldera, with the nearby Mount Warning commanding almost every view. The seat of the Tweed Shire Council, Murwillumbah also serves as the commercial centre for the smaller villages and residential developments in the valley. Extensive and diverse accommodation around Murwillumbah ranges from backpacker lodgings, cottages, caravan parks, B&Bs, pubs and motels to exclusive 5 star cabins. >> More info. 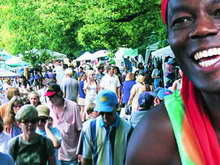 Nimbin Nimbin exploded on Australia's psyche in the 1970's when it hosted the Aquarius Music Festival. The unofficial capital of the "Rainbow Region" and Australia's alternative lifestyle capital, old shopfronts have been converted to eateries and retail shops are gaily decorated in indigenous and new age motifs. Accommodation has grown to include caravan parks, B&Bs, motel, backpackers and a pub, with a farmstay and cottage presence scattered in the hamlets around the village. >> More info. Twin Towns Tweed Heads - Coolangatta Located at the mouth of the Tweed River, the Twin Towns - Tweed Heads in New South Wales, and Coolangatta in Queensland, share a main street that straddles the state border. Some of the best sun bathing, swimming and surfing in Australia is found at here, with free barbeque and picnic facilities provided by Tweed Shire Council and Gold Coast Council at adjacent beachside parks. Over the last decade, the area has re-established itself as a family resort destination, with a number of apartment and resort developments taking advantage of its historical popularity. Here you will find a cornucopia of places to stay, ranging from 4 star hotels to pensions; from luxury serviced apartments to backpacker hostels and caravan parks. >> More info.